The Magpie's Nest...: Horses for courses - looking at the political races this year from a punter's point of view. Horses for courses - looking at the political races this year from a punter's point of view. First up, the best one liner out of the ABC's cricket commentary this week: What do you call an Indian cricketer with 100 against his name? Answer: a bowler. But a smug Aussie Magpie digresses. As he contemplates the year ahead, The 'Pie has been much occupied by a particular proverb - if wishes were horses, then beggars would ride. This ageless observation, succinctly summing up desire versus reality, is very relevant in 2012 as we enter a year which will see two if not three elections at all three levels of government. It seems that there are any number of political breeders of imaginary horses for beggars - that is, their voters - to ride. And the Bart Cummings of this phenomenon is without a doubt Bob Katter and his Cut Snake Party. 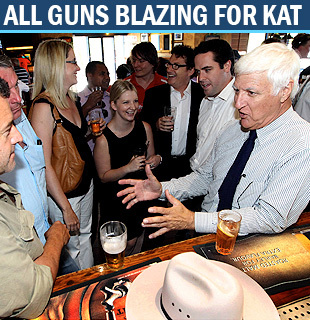 The Magpie's slogan for Katter's outfit says it all ' I'm as mad as hell, and you can take that anyway you like'. It is difficult to talk about Katter, Katternomics and the gurgling snatches of rhetoric and song that vaguely resemble some sort of English patois without risking a charge of mocking the afflicted. But Bob was at his loopy best when he launched his brigade of Cut Snake state candidates on a sprinkling of unsuspecting and somewhat bewildered Gold Coast citizenry recently. It was a launch of Katter Party state candidates for the area, but Bob is not one to let boundaries of state restrictions - or commonsense - stop him meandering off into the thickets of federal policies which have no relevance or bearing on Queensland issues. So he saddled up his first fantasy horse when he let spray at, of all things, the Federal Reserve Bank. Bob's idea is that - while he says he knows the RBA had to operate at arm's length from the government - if the general population wants lower interest rates, that's what the RBA commissioners should give them. And if they didn't, they'd be sacked and replaced with people who would do his bidding. What, like some sort of ... what shall we call it ... a sort of ... ummm ... coalition? Other fantasy horses in Bob's stable include tariffs on all imported goods, and regulating the market share of supermarket giants Coles and Woolworths to just 22% - as versus the current and worrisome 80%. This populist pap sounds good, it is what people want to hear, but they want to hear it so badly they don't pause to wonder how it would all happen and more importantly, just what the consequences would be. And Bob ain't enlightening them just yet, if ever. It is also well to remember the definition of insanity is when you try something three or more times, each time expecting a different outcome. 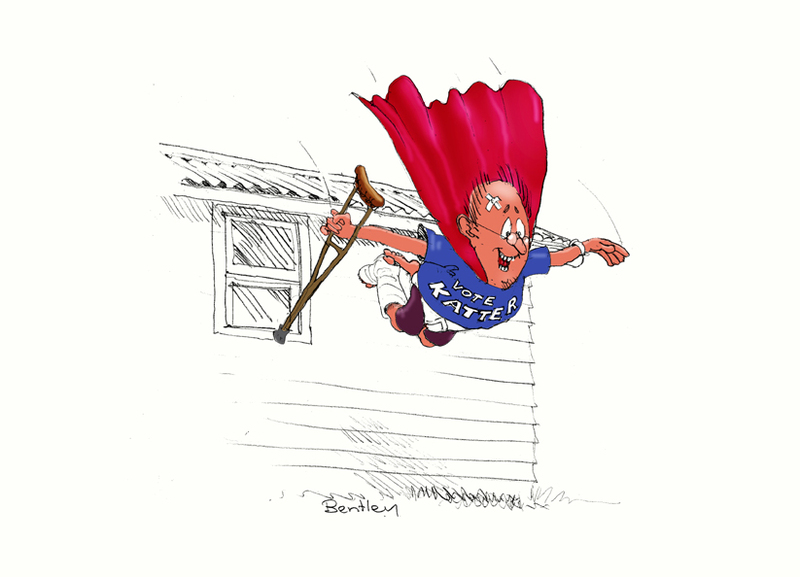 Even kids in capes jump off the verandah roof only once, instantly learning that their wish to fly is not reality, and to try it again would be painful insanity (which nowadays would make them not 'mad' but 'special' in modern buzzspeak). This last observation doesn't so much apply to Bob Katter himself as it does to those who persist in voting for him. But The Magpie believes these times of complex issues needing increasingly complex - and hopefully sophisticated - responses means we can no longer afford the luxury of likeable meatheads like the Mad Katter. But still, The 'Pie is eagerly awaiting the Kattertonic policy that will allow drivers to choose any side of the road on which to drive, that'll be fun. 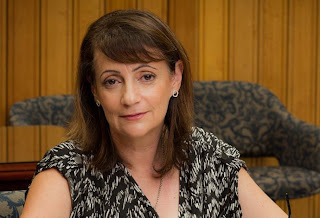 But if The Mad Katter is the Bart Cummings in this fantasy horse world, then Townsville mayoral aspirant Jenny The Moaning Mullet Hill is its Gai Waterhouse. Just as Gai does, The Moaning Mullet specialises in short distance sprinters in her fantasy stable, conjuring up rides for voters with polling day the winning post. But The 'Pie suspects The Mullet's horses, running under the names of Debt and Deficit, won't be able to go any distance beyond that, and it will be too late when her supporters suddenly realise they've ... well, been taken for a ride. Debt and Deficit are apparently identical twin horses, and even The Mullet still can't tell them apart. Alas, unless she can allay those cynics out there about just what services she will cut to be able to freeze or reduce rates, her illusory horses will be comprehensively beaten to the line by the odds-on favourite, Financial Reality. Speaking of odds, a small but important digression ... it is now odds on that McGeorge Colbran won't be contesting the mayoral race. In an email this morning responding to an inquiring squawk from The 'Pie, Macca's Man said 'Don't think my health will let me do the job properly, so at this stage, I'm only an outside chance on the second line of betting, awaiting vet's instructions'. As always, an honest self-assessment, and probably a wise one. Back on the state scene, how does The Brisbane Bantam aka Campbell Newman fit into this torturously overworked horsey metaphor? Well one supposes that he is more a trainer of hurdlers given the jumps he has to overcome. Like getting elected in the first place. But his most prominent runner, Lack of Solid Commitment, could cause interference to other runners on the northern side of the course, allowing Katter's gelding Wild Promises to get a rails run, and win the northern sector of the race. The LNP boss seems to have bought back a Vaguery colt called Trust Me, out of the ALP's old grey mare Empty Promises. There are plenty of punters north of Rockhampton who won't back Trust Me until some more detailed form is revealed, and are more likely to make a plunge on Katter's Wild Promises. There are those up hereabouts who are waiting to hear that a Campbell Newman LNP government will not be, for North Queensland, just a case of same horse, different jockey. We're waiting, Bantam me boy, we're waiting. Whew, how's all that for an over-egged metaphor? No, don't answer that. 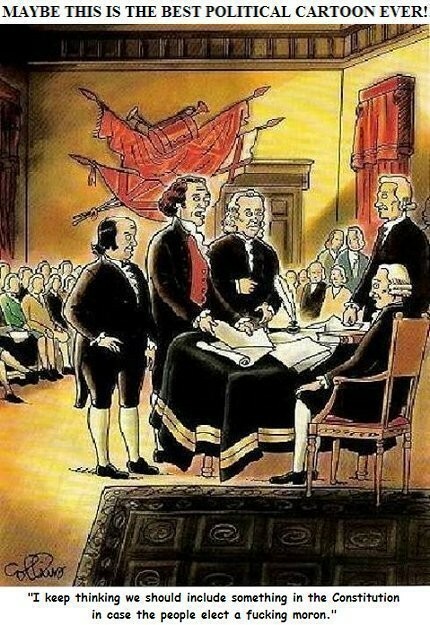 Finally, a graphic illustration that shows that the likes of Katter, Abbott, the Forrest Gump Water Watch council wannabees et al, are problems that have existed ever since the American founding fathers laid the foundations for modern democracy. Not a bit far-fetched and distinct possibility. That's enough to drive a bird to the booze, so it is away to Poseurs' Bar, where The 'Pie will harbour some forlorn hopes that it will magically become his own mounting yard for a fantasy ride in the Metaphoric Stakes. Long odds on that, though (sigh). Come on Pie. You have shown us there isn't a worthy contender there for Mayor so I think maybe it's about time you got yourself a real job and threw your hat in the ring. If you won't do it, get on Priceys back to give it a go. I'll vote for either of you. Thanks for the thoughts, magpie, I love your work. However, I feel you've given Katter's perspectives short shrift. I think that a lot of people aren't altogether happy with the uncertainty of modern, open economies, and would like to move back to an Australia where government intervention in the market (tariffs, anti-trust, nationalisation, political monetary policy) gave more certainty, less change. Whether they'd want the economic and cultural stagnation that might come with it is a different matter. Anyway, my point is that, although Katter is a bit bonkers, I like the fact that someone in the federal parliament is talking about something besides a neoliberal vision for the Australian economy. Can't have a debate without two points of view. Finally, could you please enlighten me (sometime before the next federal election) as to why Herbert is terminally unable to elect an ALP candidate? Maybe it's apparent from the demographics and geographics of the seat, but I can't understand it.